Travelling across Thailand, passing through provinces and small towns it is common to find a bunch of stalls or shops on the side of the road all selling the same thing. Generally it is what the province or town is famous for. Saraburi, a small town about 90 minutes drive from Bangkok, is famous for sunflowers and Kari Paf’s. It was not sunflower season when we went to visit Saraburi over the recent long weekend so sadly we didn’t get to see the fields of bright yellow sunflowers. It’ll just give us another reason to go back again. The other reason to go back is the delicious pastry treats, Kari Paf’s, which in English would be Curry Puffs. You can get many different flavours – chicken, pork, grape, pineapple, strawberry, blueberry and much more. Even though they are called Curry Puffs, they don’t actually have any curry in them (well the fruit ones didn’t any way). We only got to try fruit flavoured ones as we wanted to buy a box and take them back to Bangkok for friends. We got to try strawberry and blueberry which were delicious. The pastry was crispy, crunchy with just the right amount of flakiness. The filling in the middle was a little sweet but not over the top like some sweets in Thailand can be. It was the perfect balance of flavours. I’m looking forward to trying the chicken and pork ones next time. Given there are so many stalls it can be hard to figure out which is the best. 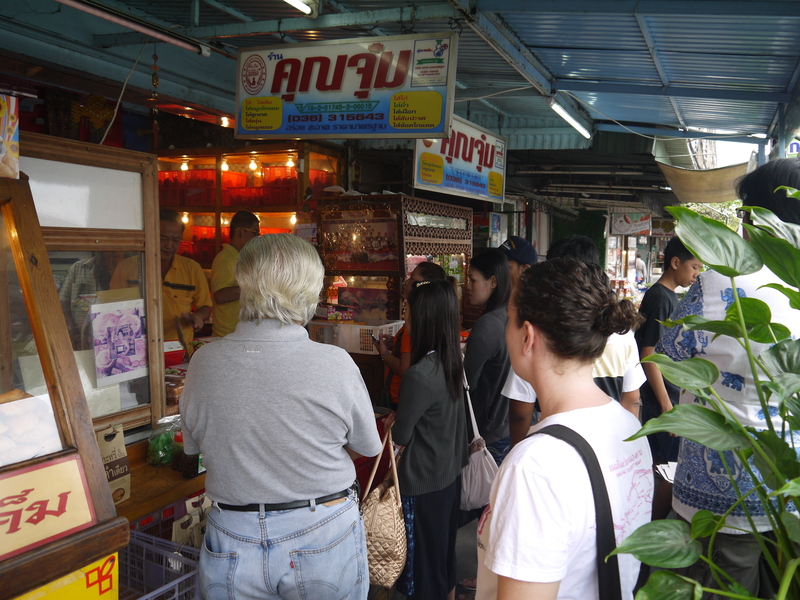 We lined up at one stall which had a huge queue but turned out to only have pineapple and meat flavors – but we figured they must be good because people just kept coming and ordering five or six boxes at a time. Since we wanted a mixture of fruit ones we moved on to another stall (Khun Aon’s stall) where we’d tried one the day before. They are pretty cheap at 6 Baht each or a box for 60 Baht (we think you get an extra one if you buy a box, well we did.) And they actually keep pretty well for a few days. Sadly we’ve finished the box we bought but our friends did enjoy them. Yum yum. I’m a Kiwi about to move to Bangkok and the thing that makes me so excited is the FOOD. I love the food here! Looks like there are some cool day/weeked trips from the Big Mango too. Fun. I’m sure you’ll love it here. If you ever want to meet up and eat some delicious Thai food then get in touch.